Fifteen years ago, on February 1, 2003, a sonic boom jarred Special Agent Brent Chambers as he was preparing to mow his lawn outside of Dallas on a chilly Saturday morning. “I knew it was something bad,” said Chambers, now retired. He jumped in his car, turned on the police radio, and learned the news: NASA’s space shuttle Columbia had broken up as it re-entered the atmosphere. 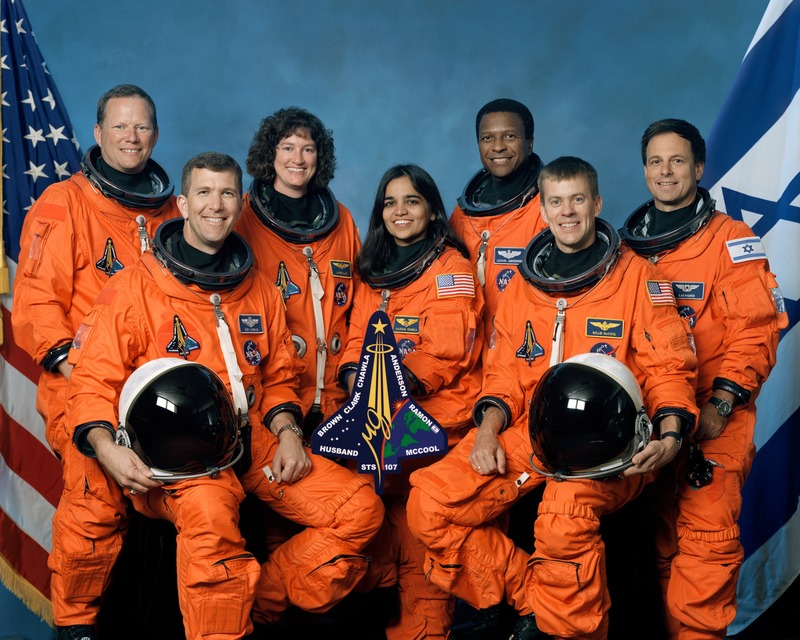 The deep rumble, which started just before 8 a.m. Central time, marked the explosive end of the shuttle and the tragic death of all seven astronauts on board. As the noise faded, debris started raining down into eastern Texas and western Louisiana. No one knew immediately why Columbia fell. But the nation couldn’t help but think about the 9/11 terror attacks less than 18 months earlier. “It was a time when people were concerned about terrorism, and it couldn’t be ruled out right away,” said Michael Hillman, another FBI Dallas special agent. Before NASA could provide any answers, it needed to recover as much of the shuttle as possible. More importantly, the crew needed to be found. The Federal Emergency Management Agency coordinated the overall disaster response, and tasked the FBI with finding, identifying, and recovering the crew. Agents and professional staff also helped secure classified equipment and safely contain and recover hazardous materials. Chambers led an Evidence Response Team, while Hillman led a Hazardous Evidence Response Team. About 500 FBI employees from Texas and Louisiana eventually worked the recovery effort. They were part of a massive team of professionals and volunteers—more than 25,000 people from 270 organizations helped search 2.3 million acres. Special Agent Gary Reinecke, a supervisor at the FBI’s Evidence Response Team Unit out of Quantico, Virginia, helped coordinate the Bureau’s recovery efforts. He and several agents with expertise in handling hazardous materials flew down in a Bureau jet, then deployed to a staging area near Lufkin, Texas. Searchers spread out across the countryside and sent coordinates to FBI teams if they came across suspected remains. “After we determined we had found a crew member, we documented the scene like we would a crime scene—we mapped it and took pictures. But in this case, we didn’t keep any evidence. We turned everything over to NASA,” Reinecke said. A NASA astronaut accompanied each FBI team that responded to reports of victim remains. The remains of all seven astronauts were recovered, despite the obstacles of terrain and the scope of the search. 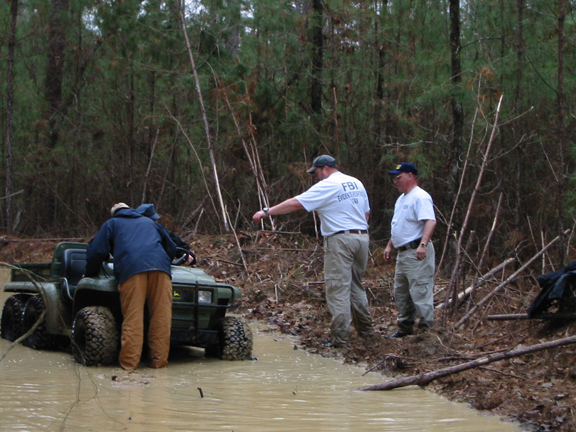 Searchers combed through pine forests, hundreds of thousands of acres of underbrush, and boggy areas. Parts of the shuttle were found in Lake Nacogdoches and the Toledo Bend Reservoir. Fortunately, the FBI has developed an expertise in responding to disasters of all types. “This is where we work best—during a national emergency. We were all highly trained. Our whole team was very well prepared and very well organized,” Chambers said. “We’ve always been good at processing massive scenes,” agreed retired Special Agent Amy Ford, who led an Evidence Response Team from the FBI’s New Orleans Field Office. Many of the team members involved in the search had rotated through one of the crash sites from the September 11, 2001 terrorist attacks. 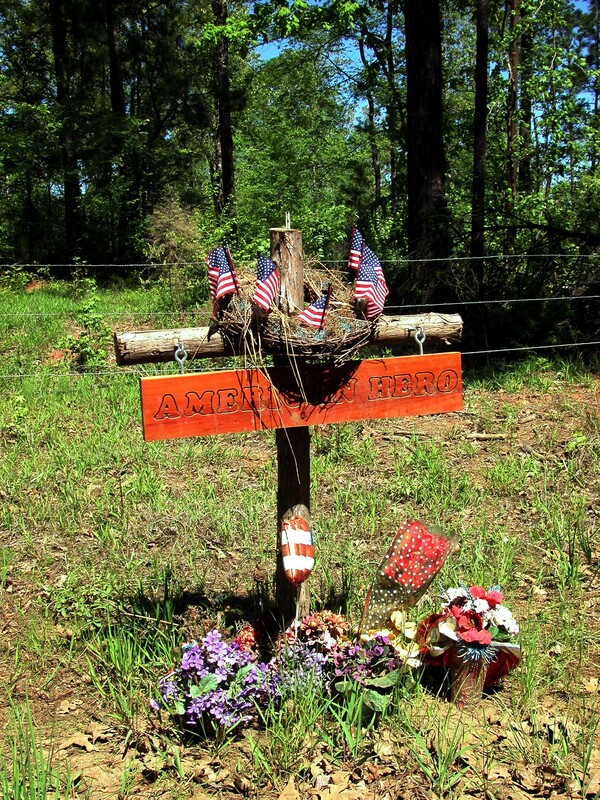 The rural location of the search also presented challenges in initially identifying human remains. “This is where people hunt. Searchers were finding bones right and left. Most turned out to be animal bones, but we had to check and verify everything,” Ford said. In addition to recovering the crew—all within a five-mile area—searchers also recovered about 38 percent of the shuttle, according to NASA: more than 84,000 pieces of the orbiter, weighing about 84,900 pounds. “Sometimes you would find a piece that was two inches by two inches. A tile. Then sometimes you’d find a piece the size of a Volkswagen Beetle,” Hillman said. 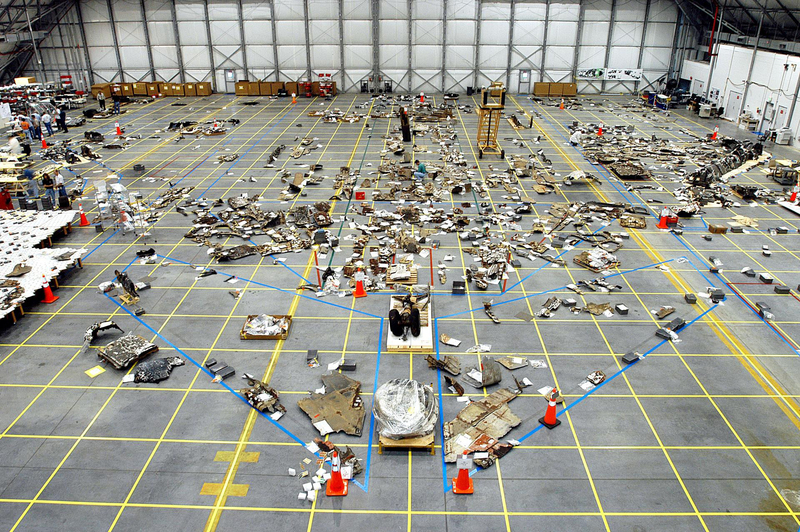 To this day, FBI offices still receive calls about potential shuttle debris being found. FBI employees each spent several weeks or more assisting with the search, often working 12-hour shifts. FBI New York’s Underwater Search and Evidence Response Team helped locate and recover debris under water. The Firearms-Toolmarks Unit at the FBI Laboratory later helped find serial numbers on damaged tiles, which helped NASA determine the cause of the crash—a thermal breach in the left wing that led to structural failure. “The FBI was a critical part of the Columbia recovery effort,” explained Ronald B. Lee, a NASA engineer and emergency manager at the Johnson Space Center. Lee said the FBI helped rule out sabotage and terrorism early on as possible causes of the disaster, helped locate crew members, and helped catalog recovered debris. “NASA thanks the FBI for its work bringing our crew home, as well as all the men and women who helped NASA during this very difficult time,” Lee added. An insider working for a government contractor in California was recently sentenced to prison for selling sensitive satellite information to someone he believed was a Russian agent. January marks National Slavery and Human Trafficking Prevention Month, but a recent case in Wisconsin illustrates how the FBI works with its partners year-round to get dangerous traffickers off the streets and obtain justice for victims.